The upper body varies from red to pale brown in colour. Juveniles are uniformly red, while adults have a silvery/white lower half. Red Morwong have a small pair of horns in front of their eyes. Maximum of approximately 4 kg and 65 cm in length. 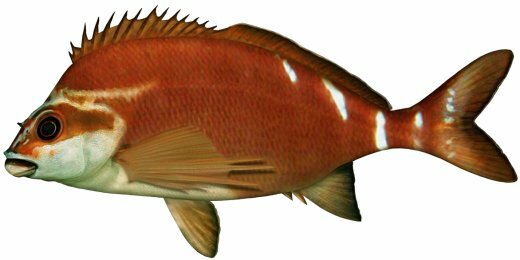 Red Morwong are confined to the east coast of Australia, from southern Queensland to Bass Straight. They are common in NSW waters, occurring in shallow coastal waters to a depth of approximately 30 m.
Occasionally confused with the Banded Morwong (Cheilodactylus spectabilis), which occurs in the southern range of Red Morwong, however, they are easily separated as the Banded Morwong does not have a pair of small horns in front of its eyes.